Roy Knippling (left) visits with T.J. Gabriel. 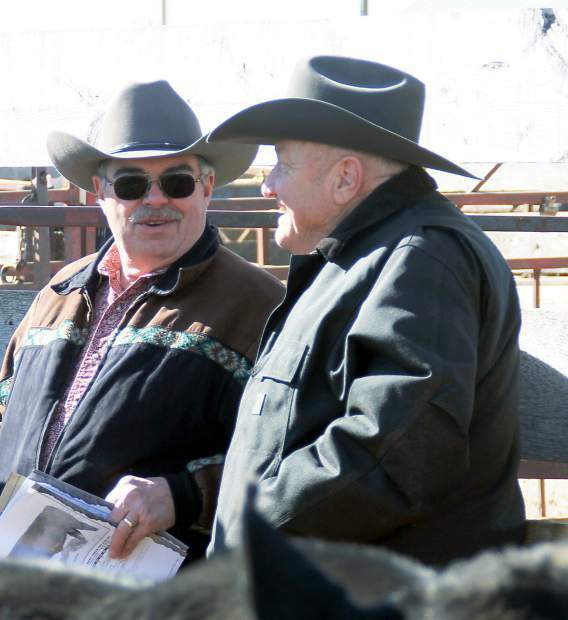 Fellow Angus breeders Donnie Miller, Estelline, SD and Jim Wilson, Whitewood, S.D., at the Deep Creek Angus sale. Gerald and Wanda Mathews, Midland, S.D., purchased Deep Creek Angus bulls. It was another beautiful February day for the large crowd of bidders that gathered at Philip Livestock to view and bid on the Angus bulls from Deep Creek Angus Ranch. 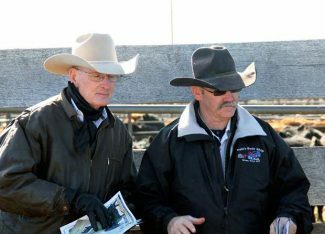 The ranch is located west of Ft. Pierre and north of Midland, South Dakota, owned by T.J. and Jeanine Gabriel, and their family. This young family understands the value of their commercial bull customers, and these repeat buyers were back again this year to give them another great bull sale. This year's offering was the deepest in quality from top to bottom that this firm has ever brought to town. TJ has bred this herd for maternal strength, and it shows. 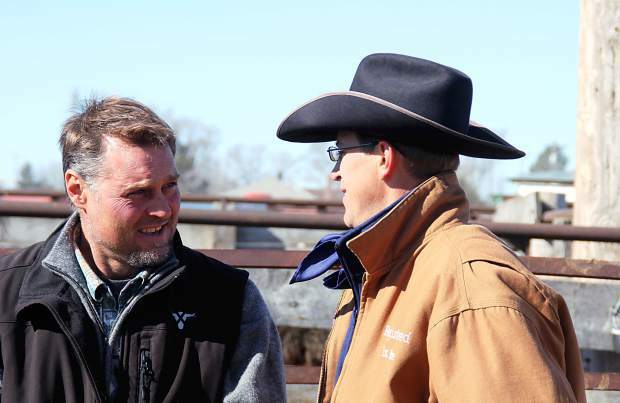 They want cows that can thrive and survive in the harsh western South Dakota environment, and still bring in a big percentage of their body weight. We get to see many of these bulls grow into maturity at various herds around the area, and quite often many of the top selling weigh up bulls at Philip Livestock were initially raised at Deep Creek Angus. Top selling bull of the day was Lot 1, selling for $22,000 to Current Creek Angus from Roundup, Montana, and Griffin Land and Livestock from Billings, Montana. He was a son of Basin Excitement and out of a Pathfinder daughter of Bennett Total who had ratioed 117 on seven calves. This good herd bull prospect had an 80 pound birth weight, a weaning weight of 811 pounds, and a yearling weight of 1,387 pounds. His EPDs were BW 0.8, WW 69, YW 115, and MILK 24. With a 38 cm. scrotal measurement and a 15.4 square inch rib eye, he had an IMF of 5.48 percent. 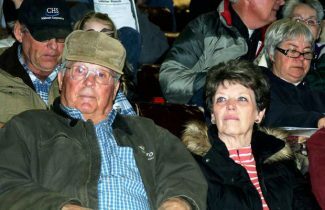 Repeat buyers Charles and Rosalie Tennis from Vale, South Dakota, chose Lot 11 at $ 16,000. This son of Rathbun Accelerate Z523 was out of a daughter of KCF Bennett Coalition and was 82 pounds at birth. He weaned at 795 pounds and yielded a yearling weight of 1,299 pounds. His EPDs were BW 2.7, WW 58, YW 96, and MILK 30. Brian Morris, Meadow, South Dakota, topped his purchases with Lot 5 at $14,000. He was a son of Connealy Arsenal 2174 and out of a daughter of Connealy Lead On who had ratioed 105 on eight calves. Born at 79 pounds, he weaned at 794 pounds to ratio 113, and posted a yearling weight of 1392 pounds to ratio 111. His EPDs were BW 1.2, WW 67, YW 120, and MILK 23. Another popular bull was Lot 10, selling to Miller Angus Farms from Estelline, South Dakota, at $13,500. Here was a son of Rathban Accelerate that was out of a Pathfinder daughter of Vermilion X Factor. With an 80 pound birth weight, he weaned at 795 pounds to ratio 114, and grew to a yearling weight of 1377 pounds. Lot 2: Connealy Arsenal x Hyline Right Way 781 to Brian Morris at $12,500. Lot 13: Bruin Uproar 0070 x Connealy Reflection to Boyd Larson, Spearfish, South Dakota, at $12,500. Lot 49: Buckit of Volga W157 x Bon View New Design 878 to C&T Cattle, Midland, South Dakota, at $12,500. Another great day for this young family and this increasingly popular herd of Angus cattle!